When I was in school there was always one objective - get the right answer. Seemed simple enough...want to seem smart? Be successful? Make your parents happy? Go to college? Well then...get the answers right, be as perfect as possible in each subject, each day. Needless to say...I wasn’t a huge fan of school. There were times I tried to cheat, especially in Spanish class. There were times that I would fake being sick...always on a test day. There were times I was stressed, times I was bored, and most of the time I just wasn’t interested in what was being shared at the front of the room...Why? Because I wasn’t perfect at school, and I didn't want to be either. I love to learn, I love to make mistakes and then learn from them...that’s why I loved the game Mario Brothers as a child...yes, the first one...because it was the mistakes I made and the “Game Over” screen that drove me to continue and start all over again. Somehow, the way I loved to learn as a child through making mistakes didn’t seem to translate to success at school. 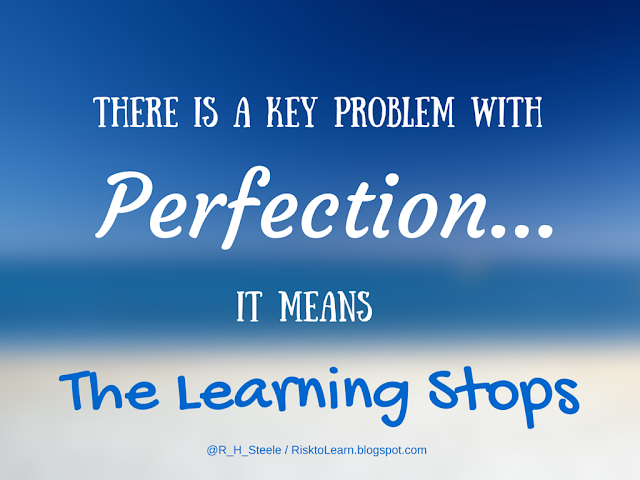 It was as if mistakes made were not acceptable, only perfection was….but here is the thing: There is a key problem with perfection...it means the learning stops. I am not saying there is anything wrong with getting that perfect grade, or getting all the math problems right...but what I am saying is that it is in the moments of perfection that we are no longer required to learn and grow. So while as educators we push our students to find the right answer, I have to ask, how can we also create an environment that encourages mistakes to be made for real learning opportunities to take place? Now, there are a ton of better examples out there I am sure for a problem to be solved...but notice something...in order to be successful students will need to be able to read, comprehend, research, write, design, calculate angles/money/amounts, collaborate, engineer, and the best part of all...there isn’t one perfect answer. I have a question. Why are we still teaching kids today the way we were taught? Lecture, straight rows, worksheets, "filmstrips," (ick) . . . Just wondering. I came across your blog from the #txedchat. I attended High Tech High, a charter school in San Diego, from 2004-2008. We did so many amazing projects. Sometimes I think that type of learning taught me more than I learned in undergrad and grad school. I'd love to see 4th graders tackling the dog project!